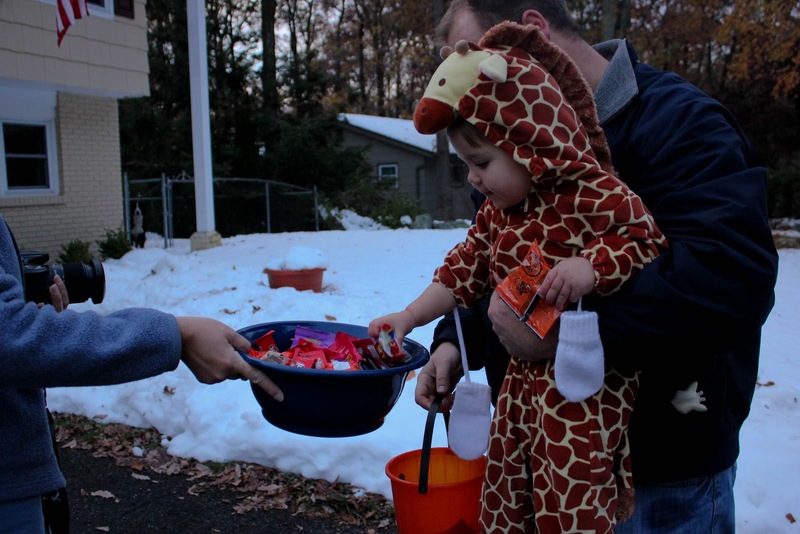 First Time Mama - First Time Blogger: Trick or Treat! Happy Belated Halloween! 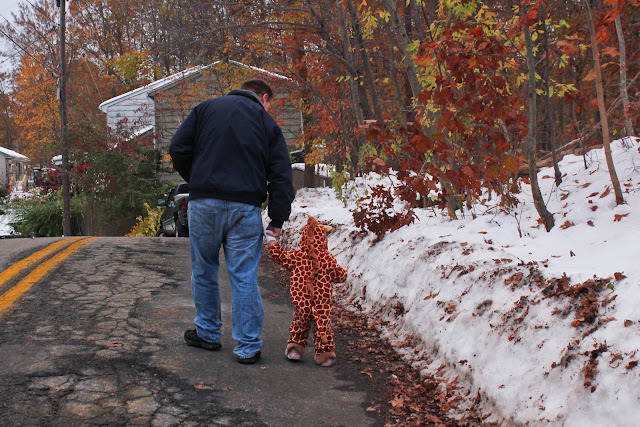 This year, we had planned on going to my mother's house to trick or treat with Julianna in her town. Well.... the weather canceled many people's plans including our own. We skipped my mom's house since they were saying not to trick or treat there. Snowmageddon hit on Saturday and stuck around for a while along with the down trees, down power lines & no power for thousands in our area! 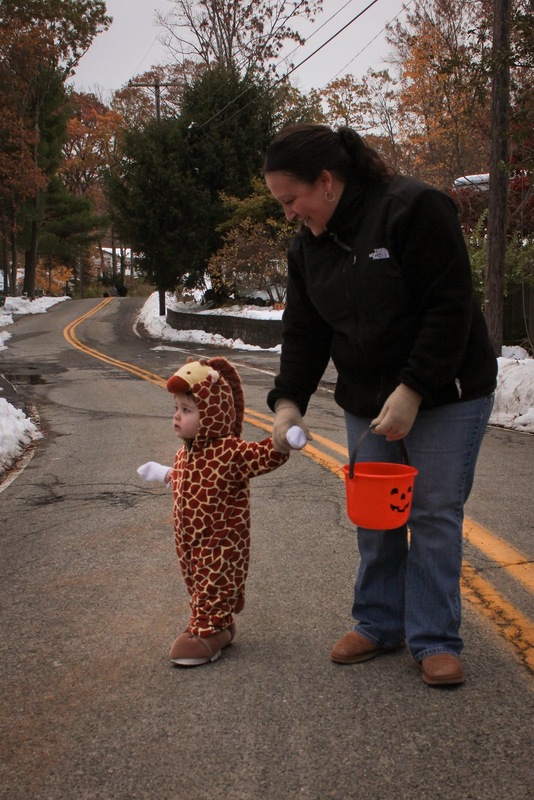 So because of the situation, many towns postponed their trick or treating until next weekend. Their thinking was, no one wants their kids running around on Halloween night with dangerous downed wires & downed trees. I agree. 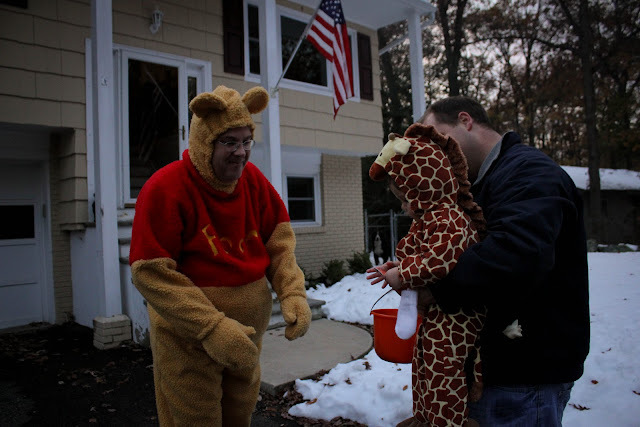 Our town didn't feel it was necessary to postpone Halloween. Way to go Hopatcong. 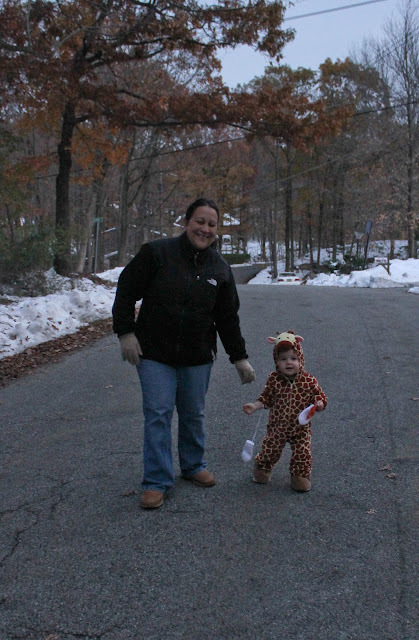 Luckily that choice did not affect us, as we just walked to a few neighbors houses with Julianna, and then drove to visit baby Jake (ok he's not quite a baby anymore, he is the same age as Julianna! ), and Miss Cathy (Julianna's daycare provider). Then we went out to eat at our favorite local pizza place with tons of other trick or treaters. Everyone was in Franks for dinner on Halloween night! My husband (Brian) walking with our little Giraffe! Eager to get to the next house around the corner! 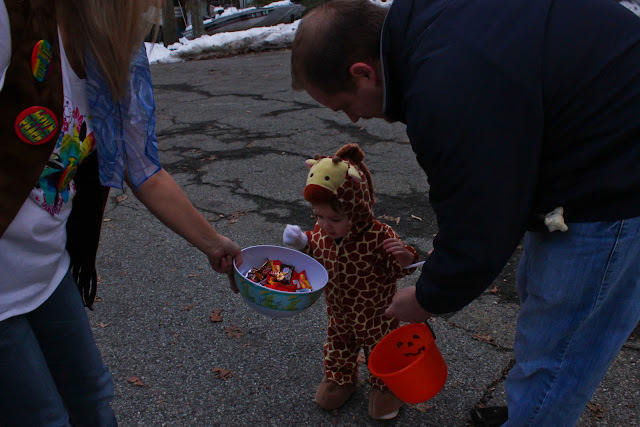 Our neighbors were very generous with giving Julianna her first Tricks & Treats! Walking to the next house. Julianna got the hang of this fun stuff right away! "Oooh, what did I get? What's in here?" "Trick or Treat. Smell my Giraffe feet!" Julianna was a bit scared of Winnie the Pooh! She did not know what to think! Brian had to pick her up and bring her to him. She just stared at this poor guy like "What are you???" haha! OK time to go home now. All tuckered out. Happy Halloween! How did everyone else celebrate? Dis you dress up or did your kids dress up? Oh she looks adorable! 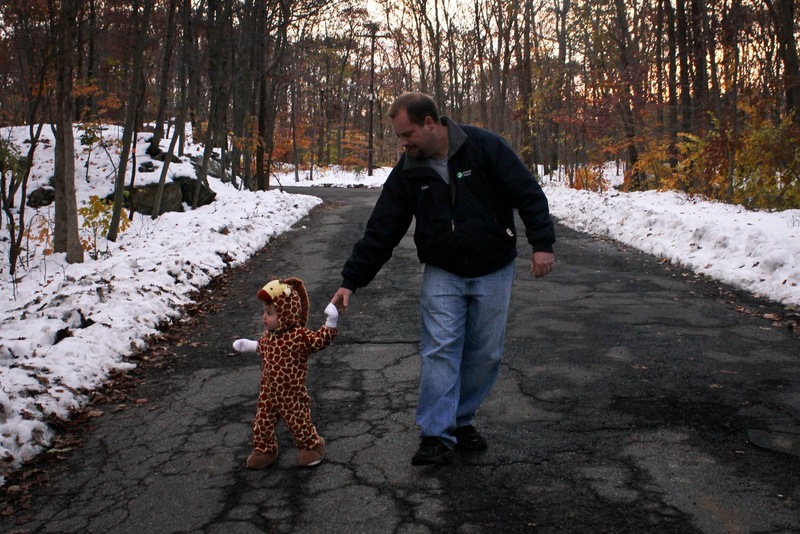 our Halloween was cancelled till tomorrow night. I think it was the sensible thing to do. Just got power back last night - since Saturday! My daughter was off two days from school. Glad things are getting back to normal. oh she is the CUTEST!!!!!!!! 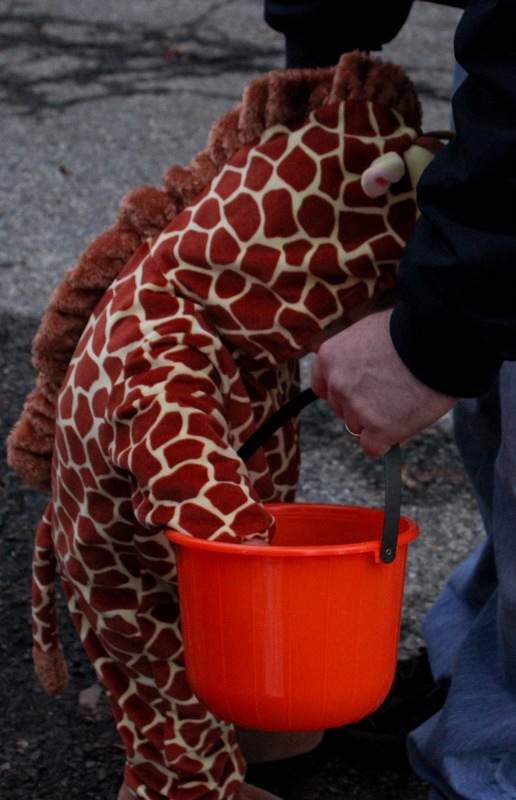 Oh my gosh, that costume is the cutest!!! How adorable Julianna looked for Halloween! My grandboys were "Super Heroes"!